If you are interested in the intersection between gut health, nutrition, and pain, this will be an episode that you will enjoy. Carrie Falling’s work and research is around central sensitization. Carrie began as a manual therapist and digestive health specialist. Illinois. After eight years of practice, she relocated to New Zealand where she became a physiotherapist working predominantly with individuals suffering from persistent musculoskeletal pain. She then left private practice to begin teaching at the University of Otago in New Zealand. She begins her PhD journey investigating persistent musculoskeletal pain in individuals with inflammatory bowel disease. 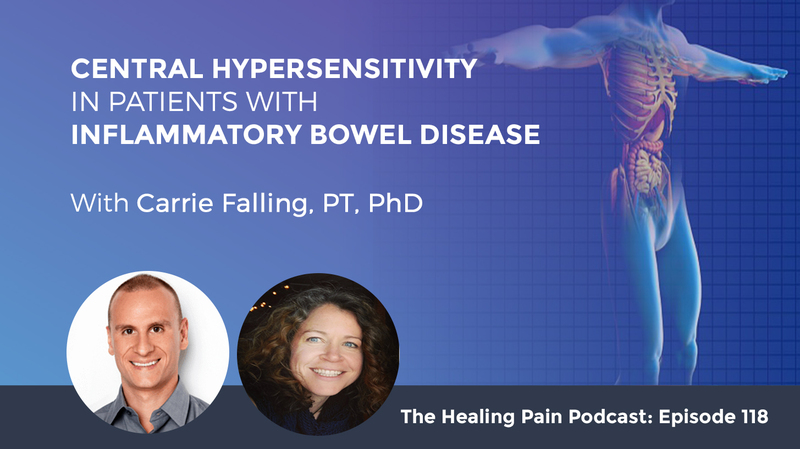 Carrie talks about central hypersensitivity and her journey into this research. Welcome to episode number 118 of the Healing Pain Podcast. It’s great to be here with you. Our guest today is Carrie Falling. Carrie is originally from the United States and began as a Manual Therapist and Digestive Health Specialist in Chicago, Illinois. After eight years of practice, she relocated to New Zealand where she became a physiotherapist working predominantly with individuals suffering from persistent musculoskeletal pain. She then left private practice to begin teaching at the University of Otago, which is in New Zealand. She begins her PhD journey investigating persistent musculoskeletal pain in individuals within from inflammatory bowel disease. If you are interested in the intersection between gut health, nutrition and pain, this will be an episode that you will enjoy. If you are new to the podcast, I’d like to extend a warm welcome and invite you to sign up for the mailing list. The way you can do that is by going to www.DrJoeTatta.com/podcasts. On the right-hand side of the screen, you’ll see a box where you can enter your name and email address so I can send you the latest episode right to your inbox each and every week. Let’s begin with Carrie Falling and learn all about central sensitization and irritable bowel disease. Carrie, welcome to the podcast. It’s great to have you here. Thanks, Joe. It’s great to be here. I was excited to meet you at World Congress. For those of you who have never been to World Congress, it’s a big pain meeting where some of the top researchers in the world come together and share their knowledge about pain. There’s also an event space where people have poster presentations. There are over 500 poster presentations. I was walking around the poster presentations looking at some information on things like CBT and ACT and mechanisms of pain but I didn’t see anything that talked about the gut and nutrition, how it relates to pain until I came across Carrie’s poster. I attacked Carrie. I seemed super enthusiastic because I was like, “There it is.” The poster is called Central Sensitization Mediates the Relationship Between Inflammatory Bowel Disease Activity and Musculoskeletal Pain Intensity. I believe it was the only poster that was talking about central sensitization as far as the gut’s concerned. You are a PT who did this research, which is even more unique, which made me get even more excited. I want to welcome you. Sorry if I attacked you, but your research is incredible and I can’t wait to talk about it. Tell the people who you are and how your career evolved to the place where you are now. You’re researching this amazing topic. Over the course of the conference, there were over 2,000 poster presentations throughout the weekend and only five were in my population, which was very startling to me. It was exciting to be there for me as well. My journey into this research has been a long time coming. I started as a manual therapist and became trained as a digestive health specialist where I treated anything from obvious digestive issues like heartburn and indigestion and bowel problems, all the way to conditions that may be the average person doesn’t realize is directly related to digestive processes. When I moved to New Zealand and became retrained as this Physio, I came into field already with a profound respect for how overarching the digestive processes are to every other system of the body. 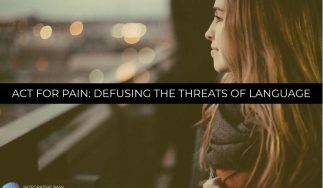 When I started in private practice here, I found myself treating this insidious persistent musculoskeletal type of pain. 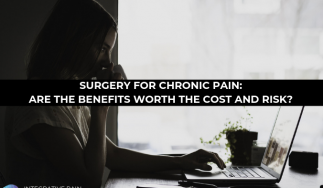 With my interest in other aspects of health, it became impossible not to see this connection between people who struggle with conditions like inflammatory bowel disease and these persistent musculoskeletal pain conditions. I became puzzled and frustrated at the lack of guidance on how to improve these individual’s quality of life and how to help manage the pain. I did what anybody does when they have a question that they don’t know the answer to. I went and started a PhD. My PhD is specifically looking at IBD. Inflammatory bowel disease is made up of two primary conditions: Crohn’s disease and ulcerative colitis. One of the things that unfortunate yet very interesting about IBD is that these individuals have a very high prevalence for developing additional conditions that we call extraintestinal manifestations of IBD. These manifestations are a specific group of conditions that affect nearly every system of the body and the most common one for them to develop is the inflammatory-based joint conditions. If you go to the literature and you look at IBD and musculoskeletal pain, you’ll find a decent body of literature that’s talking about the inflammatory joint conditions. What’s interesting is that the literature is very clear that the noninflammatory types of pain are more common in IBD, but they just don’t get talked about. If they are talked about, they’re just mentioned and they’re not further explored. Even when you look at the prevalent data about pain and IBD, it is dominated by the inflammatory joint conditions. What we have is potentially a problem that’s been grossly underestimated. It’s a problem that we certainly don’t understand. We do not have a good handle on the nature of pain and conditions like IBD. We don’t understand the mechanisms behind why these people are in pain or even what factors are modifying their pain experiences. When I took off a big bite of this topic and came into this, I didn’t realize exactly how big I was buying them off. What I aim to do is try to understand what does musculoskeletal pain looks like in IBD. Can we start to demystify the mechanisms behind why these individuals are in pain? For my first study, I went and asked over 300 New Zealanders with IBD that question and I said, “Are you in pain? 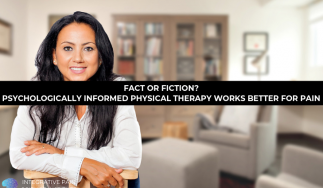 If you are, here as a whole bunch of follow up questions about your pain.” I came out of this study with a mountain of data that I could spend the next couple of years sifting through. There are a couple of things that came out of the study that was interesting to me. One of the things was that in the cohort that I looked at, over 60% of these people showed to have symptoms related to central sensitization. As I’m sure, we don’t have direct measures of central sensitization. We have a series of indirect measures that we use to look at different aspects of central sensitization. Because of the nature of this study, we decided to look at the symptomology of central sensitization in this large cohort of people which has never been done before in IBD. We use a tool called the central sensitization inventory which inventories the list of symptoms that we see in people who sensitized. It comes with a validated benchmark that says if you crossed this benchmark, central sensitization is likely a part of your clinical picture. When we use that tool in my study, over 60% of the people had symptoms significant enough to cross that benchmark to say that central sensitization is likely a part of their clinical picture, which was brand new information. It’s very exciting to be able to see some of these connections. Another interesting thing that came out of it is we saw this connection between disease activity and the severity of the pain reports that people were scoring. People who had active IBD were reporting worst severity scores, higher severity scores for their pain. When we dug a bit deeper into these ideas and we chucked this information into the mediation model, this relationship was fully explained and mediated by this benchmark of central sensitization. What this tells us is that not only is central sensitization likely to be very prevalent in IBD. It is directly and significantly impacting the pain experiences of people with IBD. That was the research that I presented at IASP. It’s for the first time that this information has been put out there. It had such a great reception. I had a lot of amazing conversations with people. The four other people who presented information about IBD all wanted to come around and talk about the research as well. It was exciting to be able to share that. Congratulations, that’s great work. I didn’t see the other four papers. I’d love to connect with you one day. Mine was a drug study and there were some other things, but just that particular population is understudied. We saw this connection between disease activity and the severity of the pain reports that people were scoring. I was waiting for it to come. I trained here in New Zealand. The framework, although a lot of it is very similar, is potentially a bit different than the training that you went through. There is a distinct lack. It just doesn’t get talked about to the extent that physios here that are practicing don’t understand why I’m doing this research. They’re like, “What does this have to do with physio?” In their defense is it’s just not talked about. We’re not taught that there’s this direct relationship between all the digestive processes and everything from here down that it’s going to be influenced by. In their defense, they just don’t get talked about these things and they don’t get talked about it in that way. I used to run these seminars because I brought my digestive health practice with me because all my patients are still in the US, but I started it here in New Zealand. It’s a new paradigm for New Zealanders. They don’t have some of this type of practitioner here. I was running these seminars just as a way of raising awareness about what it is that I even do even outside of physio and, what does that look like? One of the analogies that I used to tell is that every single process in your body is going to be run by a component that comes from your food. Your ability to get that, break it down, process it, absorb it and utilize it, that’s what I’m interested in. It’s not rocket science, so they’re all like, “That totally makes sense.” It’s just in a context that they didn’t realize how that could directly influence the musculoskeletal pain or directly influence whatever it is that they’re struggling with. I know you’ve delved into a lot of this research, but you’re studying IBD. When you go down the ladder there and go to its sister, which is IBS, there is also a great amount of research related to IBS and chronic pain or fibromyalgia. What kind of connections are you starting to think about when it comes to these topics as far as helping people with pain? They’re absolutely connected in that. The instance of IBS is greater in IBD then it isn’t the general public. People who have IBD also seem to experience concomitant IBS or IBS-like symptoms, whether they meet that criteria for IBS or not. When you look at the literature of IBD, you’re inevitably going to end up having the conversation about IBS because this is part of what they’re struggling with, which is part of what I’ve of been singing out about when I came into this research about understanding that people who have these chronic immune-based conditions like inflammatory bowel disease are at risk for having or developing or at least being part of that centrally mediated pain group of people as well. It’s never so clear as it is in people with IBD where the GI tract is being hosed down with a blowtorch of inflammation. When you look at this, and I’m using that instance of IBS to say, “It’s here.” It’s because we understand that IBS is categorized as a central sensitization syndrome and in that list of syndromes is fibromyalgia, IBS, temporomandibular joint, interstitial cystitis, you name it. CSI, the tool that I used, part A is what you scored. Part B has the list of all those syndromes and you take them off if you have this diagnosis. These are these syndromes that they correlated the symptoms from to develop that tool that we utilized. It makes perfect sense to me to see that connection. People who have IBD, being centrally sensitized puts them at risk for development of IBS or having IBS, having fibromyalgia and seeing that connection because they’re central sensitization syndromes. You can’t have IBD conversations with IBS conversations together. What would your response be to a physio or any other practitioner who says, “I was taught that central sensitization is treated with things like pain education or explain pain or CBT?” Your work starts to point people on in a potentially different direction for treatment as well. As with anyone who’s going to present with symptoms or a clinical picture that appears to be centrally-mediated, what’s important is to understand which central mechanisms are a part of their clinical picture. If they are showing to have cognitive and affective components, then those are potential targets for treatment. If they’re showing somatosensory functioning abnormalities or struggle in that area, what’s important is to understand that there are multiple mechanisms involved, centrally-mediated processes and the assessments need to encompass those different mechanisms as well as so to the targets. If a physio or whoever came to me and said, “What about CBT?” I would say, “Yes.” That’s a targeted pathway for that targeted mechanism, but you need to have an understanding if that mechanism appears to be a part of the clinical picture. I don’t have a problem with that because the next stage of my research is trying to understand this. What are the central mechanisms that are a part of the clinical picture? In my first study, central sensitization looks to be a prevalent feature in IBD. What we can’t say is what mechanisms of central sensitization aren’t participating. The next stage of my research is to try to tease that out a little bit and see if we can examine aspects of mechanisms related to central sensitization. Do we have cognitive components on board? Do we have effective components on board? Do we have some amount of sensory functioning issues on board? We understand where to target our efforts and our treatment concepts that were redeveloped. Do you foresee taking the research into the realm of nutrition and seeing if you can use a nutritional intervention to target central sensitization? When I started this research, my initial interest was coming because that’s my background and that’s what I know. When I realized that I am knocking up against a topic that just hasn’t been looked at, that is too novel to jump that far ahead, I realized I needed to start with a little bit more at the beginning of the story. There have been some conversations with me by people who are looking at nutritional concepts in IBD and who are looking at nutritional concepts in chronic pain. There’s a chronic pain group in Europe that is targeting nutritional components and they’ve spoken to me as well. There is a definite interest in my hand to get back to my roots of where I started with this to see those connections. We know that we’re seeing that in chronic pain research. We’re also seeing it in the IBD research so it’s a logical connection to make. How soon down the road that is for me? It’s difficult because I have been off a big bite that I’m currently doing. I have had some conversations with people that’s been quite interesting and telling about potentially being able to head that direction. Central sensitization looks to be a prevalent feature in IBD. What we can’t say is what mechanisms of central sensitization aren’t participating. I hope somehow it starts to steamroll in that direction even if it’s just your research informs other research to move in that direction. How would you say your research applies to clinical practice? One of the things that we’re aiming to do is to be able to identify assessments, protocols and treatment pathways that are feasible to use in clinical practice. IBD is similar to a lot of chronic conditions in that over an individual’s lifespan and/or disease course, they have a high probability of encountering a lot of different kinds of healthcare practitioners. They cover the spectrum. An IDB, that’s the frontline practitioners, which are the gastro neurologists. The GPs, nutritionist, psychiatrists, nurses, oncologists, physios, osteopaths, chiropractors, you name it, these patients have the potential to cover the full spectrum of healthcare practitioners. The issue is to understand that there’s a connection between these disease process and things like musculoskeletal pain and recognize that that also covers that spectrum of health care practitioners I’m managing. In my case, I had patients with IBD who would come see me, they had no idea that their disease was potentially related to the musculoskeletal pain. What makes sense to them is they would come to see a physio or an osteopath or whomever to get their pain treated. It’s no longer enough to create assessment protocols that target gastroenterologist as the frontline practitioners because these patients are seeking help across the spectrum of practitioners. As a physio, what I’d like to be able to do is come up with realistic tools that can be used across the spectrum, whether you’re a GI, whether you’re a GP a physio. You can have an informed treatment protocol or assessment protocols that lead towards targeted treatment pathways that can be used across the spectrum. My hope is that the complexity gets trickled down to a useful tool that can cross a lot of different professions. I often wonder, does the gastroenterologist understand? My pain shows up in every specialty and subspecialty. Does the gastroenterologist understand that? There are other ways to help people with IBD. You also have chronic pain. We need to move them faster to get treatment because we both know that the longer someone has pain, the more challenging it can be to help them reverse those patterns. One of the privileges of this research for me has been able to work with the diversity of people. On my immediate supervisor and advisory team, I have a rheumatologist. I have a gastroenterologist. I have chronic pain specialists from two countries, PTs. I’ve got a lot of different people on my project and I’m in the stages of finishing up planning for my final study. I’m coming back to the US to go to Dartmouth to work at their IBD clinic there. They’ve got a remarkable group of specialists that cover a huge spectrum of practitioners that specialize in research and treatment with IBD. Being able to bring this research to a clinic like that with their specialties is such an unbelievable privilege for me. What I’m learning from being a part of all the different specialties is that, unfortunately, for many reasons, there is segregation between the different specialties. The gastroenterologist has an impossible job in a lot of ways because they’re trying to manage a very aggressive multifactorial condition. They trying to be able to catch every little thing that is going on and understanding the connections. GPs often have an impossible job that in a short period of time, they’re going to pick up everything. My hope is that conditions like IBD will truly become that multidisciplinary concept where it’s like, “This is where I’m going to send you, this is where the referral concept gets farmed out to.” It’s opening up that interdisciplinary conversation that needs to be occurring in conditions like this. What are you pursuing in PhD? I’m pursuing physio. My primary supervisor is a chronic pain specialist that I’ve done research with. He is also a physio at the School of Physiotherapy where I’m working at, Dr. Ram Mani. He’s just an unbelievable chronic pain researcher. This is a perfect avenue for me to insert myself and we have great relationships with the med school as well. It came together very quickly and people were very encouraged by it. I have over the course of my career steered away from blanketed answers. I find that with the way the internet works now, a lot of these blanketed answers have started to work against some of the ideas that people’s digestive processes. Often, it’s a personality trait. Your struggle is going to be unique to you. It’s going to be different than my struggle, which is going to be unique to me. People have inherent struggles and the ability to produce enzymes within themselves and limitations within that. There are limitations with food sources and lots of genetics and epigenetics of it all that I have steered away from doing a lot of blanketed answers. What I tell people with IBD is to go see somebody who can help identify what processes they appeared to be struggling with and help them identify the foods that tend to create an inflammatory response. Although there are the generic foods that we understand often create an inflammatory reaction from people, not everybody struggles with that and certainly not to the same degree. If someone doesn’t have access to a practitioner then I say, “Take these big food groups, take it out for a period of time, see how you go.” Once the dust settles, then we can make some decisions. What I want people to do is to find somebody and find a practitioner. We need to get away from chasing the big blankets approach and getting towards that targeted answer. What does Joe struggle with? What do you struggle with? Let me go and assess that using a series of different assessments that we use to try to identify what that is. There’s been a lot of testing that has come out that when I started using, it revolutionized my practice. Looking even at ALCAT testing. It is the Antigen Leukocyte Antibody Cellular Testing to look at inflammatory reactions on a cellular level, on a red blood cell level with people to see. When I started doing ALCAT testing on people, I was floored by the uniqueness of the inflammatory reaction. That’s one of the reasons why I moved away from a lot of the blanketed approaches, which is what I used to do. I realized that this is individual. It’s not a great answer because I steer away from giving a lot of that. Generally speaking, garbage in, garbage out. The less the food looks like it did when it came from the earth, the harder you’re going to have problems dealing with it. If it came out of a box, a bag or a can, it’s going to be harder. Your body knows what to do with that. Your body knows what to do if there’s a carrot that looks like a carrot or tomato that looks like a tomato. We need to get away from the chasing the big blankets approach and getting towards that targeted answer. That’s what your body knows what to do with. The more we muck around with those things, the more disadvantaged your system is going to be at and your struggles will become more obvious. I tend to say eat cleaner food. Don’t put as much garbage on your food. Eat it authentically, rotationally eat your food, which Americans have gotten away from because everything is available all the time but maybe not the best quality. In countries like New Zealand, they rotational eat because they have to because crops are grown certain times of the year. When I moved here, it was awesome. It seems like, “This is how we should be eating. We should be eating the root things in winter. They should be eating potatoes in summer.” Rotationally eating and not overexposing your system to the same thing over and over again. Generally, that’s what I advise people to do and then go see somebody. Do you find the food quality to be better in New Zealand than in the US? You are of out there on an island. It’s hard to get food in and out so you have to grow it. You mentioned people with a garden there. Is that a function you think of culture there or the climate or perhaps a little bit of both? It’s a cultural necessity. Being on the corner of the planet, everything tends to be more expensive. If you want to have good quality produce, it’s cheaper to grow it in your backyard. It’s also a culture. The agricultural industry here, the farming industry here is massive. This is what people do. When you have farmers, they’re also going to grow their own food. When you have a culture of people that came from farmers and farming industries, it’s just not bizarre that you would have a chicken coop in the neighborhood that looks like suburbs in America. You have chickens in the backyard. Why don’t you have chickens in the backyard? The agricultural industry is huge here. People have chicken coops every other third person down the street and the eggs that come from that are just amazing and people share those around. It’s part of the culture. I’m not grasping onto the climate yet because I live in the South End of the South Island, which isn’t the warmest place you’ll ever be. If you want the heat, you have to go to the North End of the North Island. That’s where the avocados grow. We grow despite the climate here. As your research grows, who do you want to read it and gets immersed in it and benefit from it? The answer is everybody. The awareness needs to be raised across the spectrum of healthcare professionals. We’re going to help educate patients on their condition and to empower them to understand and to take control of their own healthcare, to take control of their own management. That education is going to only be reinforced if it’s coming from the trusted healthcare providers that they go see. My patients that look to Dr. Google to get information that they can, they’re always bringing it back to me for validation. They’re saying, “I found this. Can you read this? What do you think?” It tells me that they’re still looking to us for that confidence so I’m reaching out to the patients directly. As individuals who have these types of podcasts that make it more accessible for us to talk to patients as researchers, as that starts to evolve, then our contacts can get broader and then being able to have these kinds of conversations with practitioners. It still needs to start with practitioners. The practitioners need to understand the connection because they’re the ones that are going to make it or break it. If their patient comes to them and says, “I found this on Joe’s podcast, what do you think?” They’re going to say, “That Carrie girl, I don’t know what she’s talking about.” I need the practitioners to understand these relationships. Off the cuff, I’d say I would love for the practitioners to understand these connections while we’re trying to educate the public so they can educate patients on what’s happening inside of them. The education is a big part. I’ve had people contact me and just said, “I listened to that one podcast you had and you said something or your speaker said something. It sent me down a road that led me to get help or me getting what I needed or me just having an education. It empowered me to make a first step which can be so hard for people to make. They had pain, they’ve tried many different things. I tell patients all the time, “You need to be your biggest advocate. You have got to advocate for yourself and to do that, you need to know what you’re advocating for.” You need to educate yourself on what’s going on because if you have an understanding of what’s happening inside of you, the management becomes much clearer to everybody. Carrie, it’s been great talking to you. I’m so happy we got to connect. I’m so glad we got to talk about your research and all the exciting things that you’re doing. If people want to learn more about you, your research if they want to contact you, what’s the best way that they can reach you? You have got to advocate for yourself and to do that, you need to know what you’re advocating for. The easiest is to find me on my Twitter handle, @CarrieFalling. I believe you also said that you might put some contact information for me through the University of Otago, which is another avenue that you can go to find me. If you want to tweet to Carrie or just reach out to her, it’s @CarrieFalling. That’s her Twitter handle. Carrie, thank you so much for being here. It’s great to connect with you. If you have enjoyed this episode, make sure to show us out with your friends and family on Twitter, Facebook, LinkedIn and on social. Find her Twitter handle, find her link at the University and hop onto the newsletter at DrJoeTatta.com if you haven’t yet so I can send you the latest podcasts to your inbox each week. Many blessings to you all and I’ll see you next time. Originally from the US, I began as a manual therapist and digestive health specialist in Chicago, IL. Over 8 years ago, I relocated to New Zealand where I became a registered physiotherapist working predominantly with individuals suffering from persistent/chronic musculoskeletal type of conditions. I left private practice to begin teaching at the University of Otago (Dunedin, NZ) and then finally to begin my PhD journey investigating persistent musculoskeletal pain in individuals with inflammatory bowel disease.